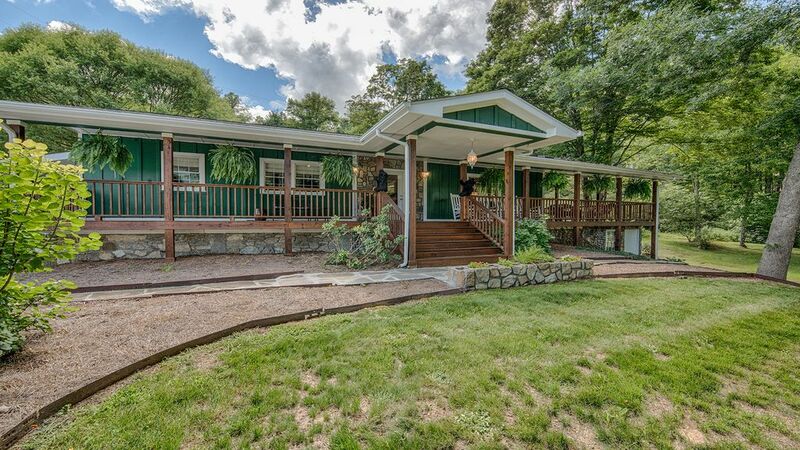 Mountain Hideaway sits on a small creek with an acre yard. A peaceful and private location located within walking distance to Maggie Valley. Located in the heart of "downtown" Maggie Valley near Market Square and near the top of a dead end, paved road. This home has easy access with level parking and covered carport. A wrap around covered porch with views of the mountains and nearby pasture. The open side porch with vaulted ceiling, skylights and ceiling fan is a perfect spot to enjoy the quiet and solitude that this little hideaway offers. The home comes beautiful furnished with 3 bedrooms, 2 full baths, a kitchen & hearth room with a flat screen TV and living room with a flat screen TV. This a non-smoking home and pets are not allowed. We are motorcycle friendly. We are approximately 5 miles from Cataloochee Ski and about 1 mile from Tony's Tube World. Wheels through Time is about 2 miles away and Waynesville about 10 miles. Asheville & Cherokee are about a 30 minute drive. We are walking distance to Fantasy Golf, Country Vittles, Market Square, Cabbage Rose, the Raymond Fairchild's Opera House and the Festival Grounds. Come enjoy some "rocking chair" time and enjoy our little hideaway! Full Kitchen with all the amenities. Comes equipped with pots, pans, dishes and utensils. Two dining areas inside the house for a total of 8. Outside seating for 6. A great place for a 3 couples. Great place for a couples retreat. Everything was amazing! House was clean and had everything we needed including dishes and towels. The living room was perfect hanging out and relaxing in the evening. The only thing we would like to have had would be a hot tub. That would have been the perfect end to a long day of snowboarding! Overall, amazing experience and would definitely stay again. Glad to hear that you all had a wonderful retreat at Mountain Hideaway and that you enjoy all the amenities (except the missing hot tub - LOL!) We have 2 other properties that have hot tubs so if that is an important item on the list just let me know and I can direct you to one of the other homes. Thank you for your great review and I hope we will see you again! Thank you for a wonderful New Years. The house was perfect for us, 3 couples and our granddaughter. Cozy and inviting. Absolutely lovely house with a perfect layout. Very comfortable beds. Spotless and fully equipped with all cooking essentials. Laundry room was a definite plus. The back porch with its beautiful scenery included a stainless steel gas-grill, ideal for our cookouts. We couldn’t have asked for a better place to ring in the New Year. Thank you for your rave review of our home on the creek. We appreciate all the details that you enjoyed about the interior and exterior of the home. We hope to see you again in the future! Thanks again! The property was just awesome. Loved the wrap around porch and rockers. The mattresses were a bit too firm for us,everything else just right. Lovely property in a great location!! We had a lovely stay. The property is updated and well stocked. It was very clean upon arrival. It is in a very central location with easy access. Will definitely consider staying here in the future. Quiet, comfortable and plenty of room for we three biker ladies. Enjoyed the porch, little waterway in back that offered a pleasant trickling sound, and a fire next to it in the late evening after riding all day in the mountains. Very nice appliances and provisions in the kitchen. Would stay here again if planning another trip to Maggie Valley. Perfect place to stay. Peace and quiet. Rates are subject to change until reservation is made. On three day weekends and holidays a minimum stay of 3-5 nights is required.